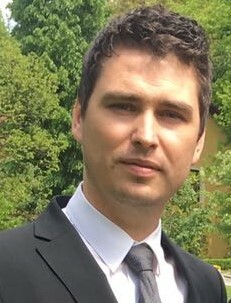 Biography: Dr. Vlad MURESAN obtained the PhD Diploma (2012) on a joint program from Gembloux AgroBioTech, University of Liege, Belgium - Ph.D. on Agricultural sciences and biological engineering and from University of Agricultural Sciences and Veterinary Medicine Cluj-Napoca, Romania - PhD on Agronomy. Since 2017, he is the Head of the Laboratory of Food Process and Structure Engineering at Faculty of Food Science and Technology, UASVM Cluj-Napoca, Romania, being also Lecturer for Extractive Technologies - Sugar, Starch, Oil; Agro-food experimental design; between 2012-2016 he was Assistant Professor in the same organization. His professional experience in the field of Agro-Food Engineering has been gained during the PhD program (Ph.D. in Belgium-Romania), post-doctoral studies as well as research internships conducted within the World Wide Confectionery Process Development at R&D Center Kraft Foods, Munich, Germany (6 months in 2009), BOKU University in Vienna, Austria (3 months in 2007) and Gembloux Agro-Bio Tech, Belgium (8 months in 2011, 1.5 months in 2015). His research interests are related to: agro-food products quality control; oil-seeds processing; experimental design; chemometrics; Infrared Spectroscopy; Rheology; Lipid Oxidation, intellectual property rights. He attended at 9 international conferences, and published in extenso 54 scientific papers – (from which 22 articles are ISI Web of Science); Book Chapters International Publishers – 1; Practical notebooks – 1. Main author of 8 ISI Web of Science Core Collection articles with impact factor (1xQ1; 3xQ2) and co-author of 7 ISI Web of Science articles with impact factor (3 of them last author, 3xQ2). He is also author of 2 patents granted (2016, 2018) and has filed 9 other patent applications (3 as first author), having numerous awards at international invention fairs. 1. Muresan V* et al. (2017) Processing Sunflower Seeds into Kernels, Hulls, and Paste, In: Sunflower Oil: Interactions, Applications and Research, Ed. Monwar Hossain, NOVA Science Publishers, New York. ISBN: 978-1-53611-889-6. Chis MS, P?ucean A, Stan L, Muresan V, Vlaic RV, Man S, Biris-Dorhoi ES, Muste S (2018), Lactobacillus plantarum ATCC 8014 in quinoa sourdough adaptability and antioxidant potential, Romanian Biotechnological Letters 23(3):13581-13591 (IF =0.321). Muresan V*, (2018). Particle Size Analysis by wet Laser Diffraction for anhydrous food suspensions: Application to sunflower tahini. Bulletin of University of Agricultural Sciences and Veterinary Medicine Cluj-Napoca. Food Science and Technology; Vol 75, 1: 43-52. Sturza, A., Muresan, A. E., Racolta, E., Muste, S., Paucean, A., Man, S., & Muresan, V. (2016). Textural and sensorial characterization of a new oat based product. Bulletin of University of Agricultural Sciences and Veterinary Medicine Cluj-Napoca. Food Science and Technology; Vol 73, No 2, 111-116. Muresan EA, Vlaic RA, Muresan V*, Petru? G, Chis S, Muste S (2017). Development and characterization of a biologically active white sauce based on horseradish, onion, parsley and parsnip. Hop and Medicinal Plants,Cluj -Napoca, Romania,Year XXV, No. 1-2: 139-148. Sturza A, Kouassi-Koffi JD, Muresan V*, Muste S (2017). Texture and Sensory Profiles of New Developed Sugar-Free Sunflower Kernels Bars. Journal of Agroalimentary Processes and Technologies 2017, 23 (3): 175-180. Chis M, Muste M, P?ucean A, Man S, Muresan V, C?lian (Ianos) DI (2017). A comprehensive review about anticancer and antimicrobial activities of rosemary oil (Rosmarinus Officinalis L). Hop and Medicinal Plants, Year XXV, No. 1-2: 28-37. Bouacida, S., Muresan, V., Essaidi, I., Blecker, C., & Bouzouita, N. (2016). Pesto Sauce Type Products: Influence of Beeswax and Storage Conditions on Rheology and Colloidal Stability. 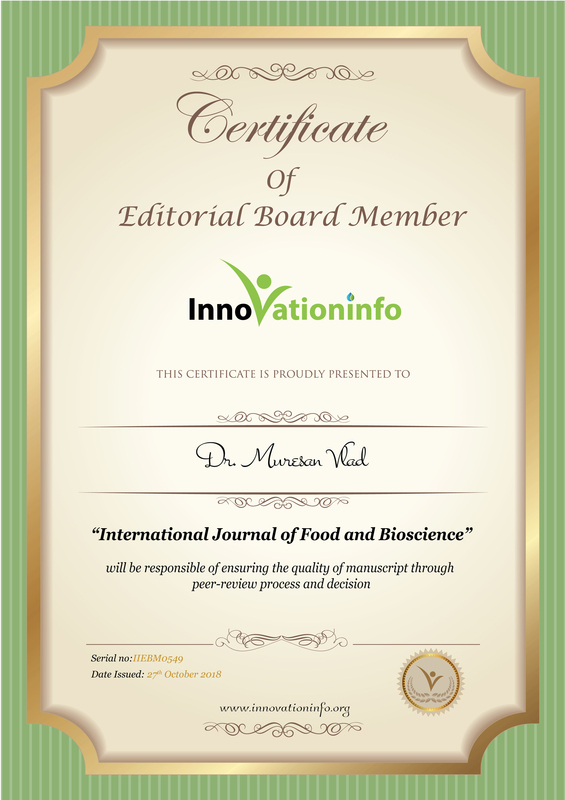 Journal of Microbiology, Biotechnology and Food Sciences, 6(3), 911-920. Kouassi-Koffi, J. D., Ahi, A. P., Faulet, B. M., Gonnety, T. J., Muresan, V., Mudura, E., & Assemand, E. (2016). Essential Steps of Bread making Process Due to Relevant Rheological Parameters of the Raw Material. International Journal of Pure & Applied Bioscience, 4(2), 58-70. Vlad Muresan, 2015, S? în?elegem dieta ca stil de via?? si nu ca pedeaps?, Cetatea Credin?ei (Revist? bimestrial? editat? de Parohia Ortodox? Floresti), V (3): 4-5, ISSN 2286-4407. Vlad Muresan, 2013, Nutri?ie si alimente – Mânc?m pentru a tr?i, nu tr?im pentru a mânca, Cetatea Credin?ei (Revist? bimestrial? editat? de Parohia Ortodox? Floresti), III (4), 4-5, ISSN 2286-4407. Muresan V., Carmen Socaciu, E. Racolta, (2008), Pilot Scale Production of some Dietetic Drops and Candies, UASVM CN Students Symposium, Revista Agricultura, XVII. Muresan V., C. Socaciu, E. Racolta, (2009), Production and Characterization of Some Dietetic Confectionery Products, UASVM CN Students Symposium, Revista Agricultura, XVIII. Vlad Muresan, Lucian Cuibus, Anna Olari, Emil Racol?a, Carmen Socaciu, Sabine Danthine, Sevasti?a Muste, Christophe Blecker, Texture and Stability of Sunflower Halva Produced from Different Particle Size Tahini. The 13th International Symposium „PROSPECTS FOR 3rd MILLENNIUM AGRICULTURE” University of Agricultural Sciences and Veterinary Medicine Cluj-Napoca, 25– 27 September, 2014. The 12th International Symposium, Prospects for 3rd Millennium Agriculture, 26 – 28 September 2013, Cluj-Napoca, Romania – The influence of palm oil addition on sunflower halva stability and texture, Muresan V, Danthine S, Racol?a E, Muste S, Blecker C, Borsa A, Muresan EA. The 9th International Symposium, Prospects for 3rd Millennium Agriculture, 26 - 28 September, 2010 Cluj-Napoca, Romania – Determination of peroxide value in sunflower halva using a spectrophotometric method. Authors: Muresan V, Muste S, Racolta E, Semeniuc CA, Man S, Birou A, Chircu C.
2nd EMUNI Research Souk, 14 June 2010, „Living together in the multi-cultural society”, The Online Euro-Mediterranean Research Multi-conference, Use of Some Medicinal Plants in Sugar Free Confectionery Products, Muresan V, Muste S, Socaciu C, Racolta E.
RACOL?A, Sevasti?a MUSTE, and Carmen SOCACIU. New Approach on Sunflower Kernel Processing - Partially Defatted Paste with Several Technological Applications. The 14th International Symposium „PROSPECTS FOR 3rd MILLENNIUM AGRICULTURE” University of Agricultural Sciences and Veterinary Medicine Cluj-Napoca, 24– 26 Septembrie, 2015. The 4th CASEE Conference "Food and Biomass Production - Basis for a Sustainable Rural Development", 1 – 3 July 2013, Zagreb, Croatia – The influence of calcium carbonate-wheat flour mix addition on sunflower halva stability and texture, Muresan V, Racol?a E, Muste S, Danthine S, Blecker C.
Emil RACOL?A, Hatice SEMIZER, Ferda SEYHAN and Vlad MURESAN. Preliminaries Trials for Ultra-Fine Friction Grinding of Sunflower Seeds – There of Tahini and Halva Production and Characterization. The 14th International Symposium „PROSPECTS FOR 3rd MILLENNIUM AGRICULTURE” University of Agricultural Sciences and Veterinary Medicine Cluj-Napoca, 24– 26 Septembrie, 2015. Elena Andru?a MURESAN, Sevasti?a MUSTE, Romina Alina VLAIC, Anamaria Pop Vlad MURESAN. Assesment of The Total Antioxidant Capacity of Apples from Phisiological Falls. The 14th International Symposium „PROSPECTS FOR 3rd MILLENNIUM AGRICULTURE” University of Agricultural Sciences and Veterinary Medicine Cluj-Napoca, 24– 26 Septembrie, 2015. Romina Alina VLAIC, Andru?a Elena MURESAN, Vlad MURESAN, Crina Muresan, Doini?a BORS, Ovidiu Petru MOLDOVAN and Sevasti?a MUSTE. Starch Changes during Growth and Development of Three Plum Varieties. The 14th International Symposium „PROSPECTS FOR 3rd MILLENNIUM AGRICULTURE” University of Agricultural Sciences and Veterinary Medicine Cluj-Napoca, 24– 26 Septembrie, 2015. Elena Andruta Cerbu (Muresan), Sevasti?a Muste, Andrei Borsa, Romina Vlaic, Vlad Muresan, (2013), Assessment of apple peel chlorophyll content on three different varieties during fruit growth, Book of Abstracts, 60, 4th CASEE Conference "Food and Biomass Production - Basis for a Sustainable Rural Development". Elena Andru?a Muresan, Sevasti?a Muste, Borsa A., Romina Alina Vlaic, Muresan V., 2013, Chemical characterization of fruits from Ionathan, Golden Delicious and Starkrimson apples varieties from the Romanian market, Book of Abstracts, 272, The 12th International Symposium, PROSPECTS FOR 3rd MILLENNIUM AGRICULTURE, 26 - 28 September, 2013 Cluj-Napoca, Romania. Patent Application no. A01013/ 2017 "Compositions for spreadable product made of cold pressed vegetable oils and spice plants"
Patent Application No. A/01101 from 12.12.2017: "Process for making Kashkaval cheese with enhanced microbiological stability at ripening"
“Spreadable cream-type sugary product made of roasted sunflower seeds and carobs”, Romanian State Office for Inventions and Trademarks Patent request no. A00834 / 16.11.2012.